Small-scale commercial brewers continually and rightly complain about their unfair treatment at the hands of our Federal Government compared to many of their counterparts in other countries. The sole concession that they seem to have been given is a refund of some of the beer excise paid, but this applies only to the very tiniest of the brewers. The recently-announced extension of that concession is a step in the right direction, and has been heartily applauded, but for the wrong reasons. An examination of the recent history of beer excise in Australia will explain why. Until 1984, beer excise was imposed on the simple basis of the amount of beverage, irrespective of its alcohol content. In the Federal Budget of August that year, a distinction was made between ‘low alcohol’ and ‘full strength’ beers for the purpose of imposing excise. Low alcohol beer was defined as any beer having an alcohol content greater than 1.15 and up to 3.8 per cent by volume, and full strength beer as any beer having more than 3.8 per cent alcohol by volume. The 1.15 per cent lower limit was that which traditionally had defined beer for excise purposes; any beverage below that strength had since Federation been deemed not dutiable. Full strength beer continued to be taxed from August 1984 at the existing rate of 66 cents per litre, but the excise on low alcohol beer was reduced to 58 cents per litre. This change was intended to encourage the consumption of low alcohol beers for health and road safety reasons, and was expected to cost $12 million a year in lost revenue. This was the excise regime under which the first modern Australian microbreweries operated, remembering that the earliest of them, the Old Ballarat Brewery in Victoria, quietly came into production a few months before the treasurer’s budget speech in August 1984. 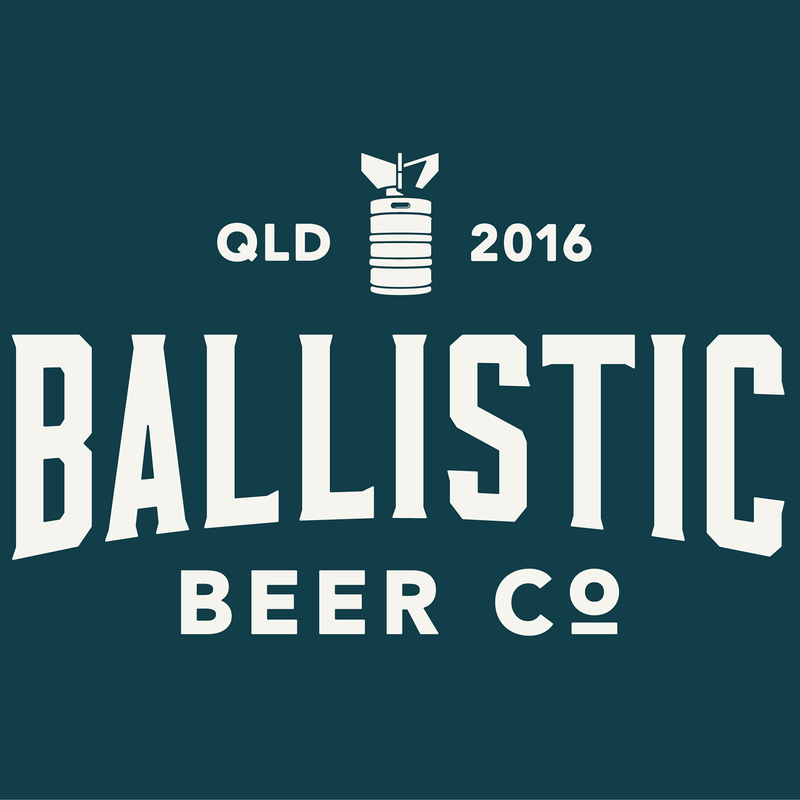 The next, the Sail and Anchor Pub Brewery in Western Australia, was about a month away from pouring its first beer when these changes came into effect. Voices in the wilderness. 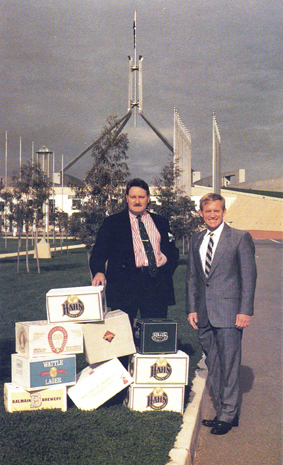 Blair Hayden (Lord Nelson Pub Brewery) and Chuck Hahn (Hahn Brewery), representing Australia’s small breweries, presenting their cases in Canberra, 1989. Other pioneer small breweries represented in the display are Kellys, Scharer’s, Eagle Hawk Hill, Sovereign, Kiewa and Balmain. The method of imposing excise on beer was next altered in August 1988, and again the changes concerned low alcohol beer. Instead of the two strength categories of beer introduced in 1984, excise was levied from 24 August 1988, the day after the Budget announcement, on the actual amount of alcohol contained in the beer, in excess of the 1.15 per cent threshold. In addition to changing the method of imposing beer excise, the rate of excise payable was also reduced, substantially, but this reduction was mostly offset by the simultaneous imposition of a 20 per cent wholesale sales tax on beer (which formerly had been exempt from WST). These combined measures were expected to cost the enormous sum of $400 million in foregone revenue in 1988–89. When these changes came into effect in August 1988, the number of new small breweries in operation in Australia had grown to about twenty-four. Only a trivial amount of their output, if any, was low alcohol beer (in the sense of the 1984 rules), so in general they were disadvantaged by the new excise rates. Ignoring the sales tax for a moment, the new method of calculating excise imposed a disproportionate burden on beer with ‘higher’ (but nevertheless normal) alcohol content, the bread and butter of the new small breweries, as the following examples show. The initial excise rate of $11.70 per litre of alcohol equated to about 27 cents per litre of 3.5 per cent beer (compared to 58 cents previously), and to 45 cents per litre of 5 per cent beer (compared to 68 cents previously). In other words, the excise payable on 3.5 per cent beer had fallen by 53 per cent, but that on 5 per cent beer by only 34 per cent. The new 20 per cent wholesale sales tax also affected the small breweries disproportionately, as the wholesale prices of their products were much greater than those of the big breweries. In general, the small producers were less mechanised, more labour intensive, and used relatively greater quantities of more costly ingredients. The changes prompted the formation in 1989 of the Small Brewers’ Association of Australia, which took its case (an its cases) to Canberra, but to no avail. The new small breweries were the invisible victims of the tax reform juggernaut. The year 1992 was also significant in taxation terms because of major changes that were made to the wholesale sales tax system. These changes were announced by treasurer Dawkins in April 1992, and were implemented some months later through the Sales Tax Assessment Act 1992. The changes had their origin in a review by the House of Representatives Standing Committee on Industry, Science and Technology, and its January 1990 report entitled Small Business in Australia: challenges, problems and opportunities (the Beddall report). The Beddall report recognised that the wholesale sales tax system was ‘one of the most complex, contradictory, administratively difficult and costly of all taxes, particularly for the small business community’, and recommended changes designed to lessen the compliance burden for small businesses. Of great relevance to this story, the Sales Tax Assessment Act 1992 allowed small businesses of any type with less than $10,000 annual sales tax liability to claim an exemption from the tax (although doing so meant that they would be liable for sales tax on inputs, so claiming the exemption did not suit some small businesses). This was in contrast to an existing system under which only a manufacturer who paid sales tax of less than $1,000 could claim an exemption. Interestingly, a June 1995 report of the Senate Economics References Committee entitled Tax Treatment of Small Businesses recommended that the $10,000 sales tax threshold for the small business exemption be indexed annually, to preserve its value against inflation, but this did not happen. Although not the result of any systematic review of taxation, a change occurred in 1997 to the rate of sales tax on beer that was nevertheless far from insignificant. It resulted from a landmark constitutional case in the High Court of Australia concerning business licensing (franchise) fees imposed by the States. The right of the States to impose such fees had been challenged as unconstitutional, and the High Court, adopting a broad interpretation of ‘excise duty’, agreed. In summary, franchise fees are an excise duty; excise is the prerogative of the Commonwealth; therefore the State fees are illegal. The High Court had been asked to rule only on the validity of tobacco licensing fees, but its decision brought into doubt the validity of fees imposed on alcoholic beverages and petrol as well. Fearing the loss of a huge amount of revenue (about $5 billion in 1997–98), the States unanimously requested the Commonwealth to use its taxing powers to collect these taxes on their behalf. This remedy was implemented by way of new Commonwealth legislation in August 1997. In the case of beer and spirits, the prevailing rate of Commonwealth wholesale sales tax (22 per cent since 1 July 1995) was increased by 15 percentage points to 37 per cent, effective from 6 August 1997. An unintended consequence of this increase was that many small businesses would be forced over the $10,000 exemption threshold. To avoid this, further legislation was passed later in August 1997 to allow the extra tax paid to be excluded when determining whether the threshold had been exceeded. A major streamlining of Australia’s taxation system occurred in the year 2000 with the introduction on 1 July of the goods and services tax (GST). The GST replaced the existing wholesale sales tax, which was abolished. Of course, when the WST was abolished, so was the small business sales tax exemption, which had been extended in 1992. I’ll return to that later. Mostly, the GST simply replaced the WST, but doing that in the case of beer and spirits, given the abnormally high rate of sales tax of 37 per cent applicable to those items, would have resulted in a substantial reduction of government revenue. The solution was to increase excise to offset the removal of the sales tax. The new rates of excise were applied by way of the Excise Tariff Amendment Act (No. 1) 2001 and came into effect, retrospectively, on 1 July 2000. The opportunity was taken on this occasion to complicate the beer excise system by creating three different strength categories: up to 3 per cent alcohol by volume (‘light’); over 3 and up to 3.5 (‘mid-strength’); and over 3.5 (‘full strength’). The alcohol content of the beer in each category was subject to a different rate of excise, in contrast to the single rate per litre of alcohol that had been introduced for simplicity in 1988. The Excise Tariff Amendment Act (No. 1) 2001 also introduced another complication; different rates for beer packaged in ‘individual containers exceeding 48 litres’, a clumsy proxy for draught beer, but that is another (very interesting) story. The new three-class system accentuated the disproportionately harsh treatment of stronger beer under the single class system of 1988. It did so by applying higher rates of tax ($ per litre of alcohol) to stronger beer, instead of the single rate that applied to beer of all strengths (above 1.15 per cent) under the 1988 system. In devising the changes required to be made to the beer excise regime to offset the abolition of the WST upon the introduction of the GST, it became apparent to the government that these would disadvantage some small-scale beer producers who benefited from the about-to-be-abolished small business WST exemption. Accordingly, in June 2000 assistant treasurer Kemp announced that some compensatory measure would be developed to ‘preserve the competitive position’ of those microbreweries. The resulting measure was introduced by way of the Excise Amendment Regulations 2000 (No. 7), gazetted in December 2000, and taken to have commenced on 1 July 2000. The method adopted by the new regulations to correct this anomaly was to refund a portion of the excise paid by qualifying small brewers, more-or-less equivalent to the value of the lost WST exemption. The qualifications included an annual production not exceeding 30,000 litres, and the benefit was limited to $10,000 per year, the same as the threshold for the WST exemption. A by-product of this scheme was the creation of a legal definition of ‘microbrewery’ for the first time in Australia. It is a definition, however, that applies only to this particular regulation, and is ludicrous in any other context. So, that is how the present excise exemption for small breweries came into existence; not, as Rob Oakeshott stated in Parliament earlier this year, as an action designed to ‘nurture the development of small craft breweries’, but as a last minute measure to preserve an existing entitlement in the face of major taxation reform. The idea that the original exemption was framed in 2000 to support the emerging microbrewery industry really misses the point. Until now, microbreweries have never been considered in this way by the government, so their treatment is really worse than they think. 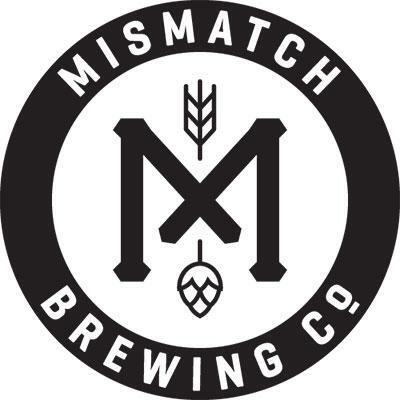 The extension to the microbrewery rebate scheme announced in the May 2012 Budget speech involves the increase of the maximum refund from $10,000 to $30,000 per year, and the removal of the production eligibility threshold of 30,000 litres per year. These amounts still fall far short of the levels of assistance that have been sought by various microbrewery representative bodies over the past twenty-or-so years. For instance, in its 2009 submission to a review of Australia’s taxation system (the Henry review) the Australian Association of Microbreweries suggested raising the maximum annual excise refund to $500,000, to achieve both a helpful and reasonable level of assistance, and equivalence with the treatment of small wineries in this country. Nevertheless, the latest change represents probably the first occasion in more than twenty years of arguing and pleading for special taxation treatment that microbreweries in Australia have been recognised by the Federal government as constituting a separate ‘industry’ with particular needs. I say ‘probably’, because without the temporary and exaggerated power that support for a minority government has given to a small number of independent members (notably Oakeshott) and a Greens senator (Milne), it is unlikely that the present Government would have come to this realisation of its own accord. It is of further significance that the ability of the Government to undertake the changes that it has promised rests upon the existence of the present rebate scheme. Although that scheme rose from an anomaly in the introduction of the GST in 2000, it nevertheless provides a basis for the more sensible and appropriate scheme now promised. In the absence of some systematic review of alcoholic beverage taxation in this country (such as was proposed by the Henry review, but was ignored by the Government), this fiddling around the edges may be the best that we can expect. What a great piece! In your research did you find any evidence for the claim that the 48L limit was lobbied for by big breweries to disadvantage European imports (increasingly coming in 30L kegs due to workplace safety laws there)? Very well documented evolution of the situation Brett. As for the 48 litre min on keg beer, Ian, that was a result of the AHA’s successful $85M lobby to have draught beer be given a lower rate of excise to compensate for the loss of the advantage that it experienced under the previous State Licensing Fee structure which was abolished in 2000 as part of the introduction of GST. Part of their argument was related to hotels and on premise venues being higher contributors to the economy (more employment etc) than off premise bottle shops etc. I’m not saying this is right or wrong, just providing the facts. However I agree that the 48 litre minimum should now be revisited to allow vessels that are more reflective of today’s marketplace. I.e. More products available (smaller kegs allow for more beers to be tapped in coldrooms), allow for one-way kegs (environmental issues), and OHS.